Forza Horizon 2 was a game I was beyond hyped to play before I got an Xbox One and I still consider it one of my favourite games of all time. I was a bit skeptical whether Playground Games would be able to put out something as good but they blew me away with Forza Horizon 3. Two years later, they aim to improve on the fantastic Forza Horizon 3 with a interesting take on their tried and tested festival setting in Horizon 4 and the end result is almost perfect. It is always interesting when a spinoff franchise basically overshadows the mainline series but that is exactly what happened with Forza. The mainline Motorsport games have been ranging from good to disappointing with the last few entries but Horizon has consistently been beyond fantastic. 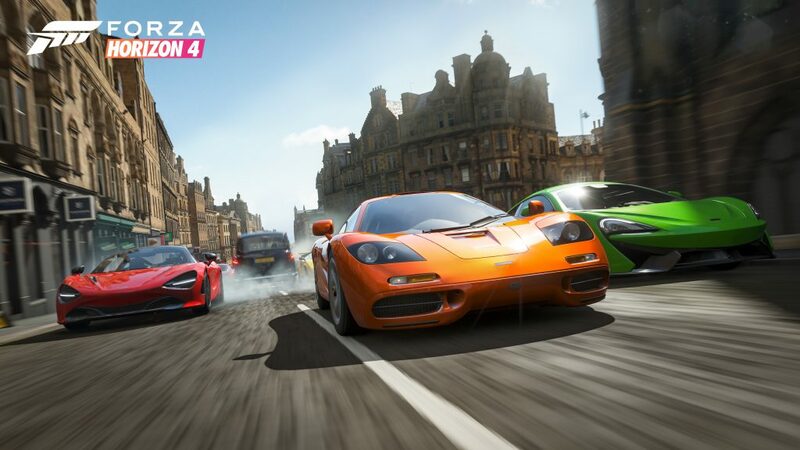 After putting out games set in the US, Europe, and finally Australia, Playground Games takes you to the UK for Forza Horizon 4. I was a bit concerned about the setting, but the fictional recreation with some choice monuments has been a blast to play through. Locations are varied and stunning almost all the way. Forza Horizon 4 adds to every aspect of previous releases and you notice this immediately with customisation. Instead of offering players an option of picking one of many pre created characters, you can now follow that up with various cosmetics like headgear, gloves, watches, glasses, and even a golden moustache. A lot of these items are unlocked through fulfilling in game requirements or through wheelspins. Wheelspins are now split up into Super Wheelspins that are basically three at once and normal Wheelspins and you earn them both at a steady pace while completing the various campaigns here. 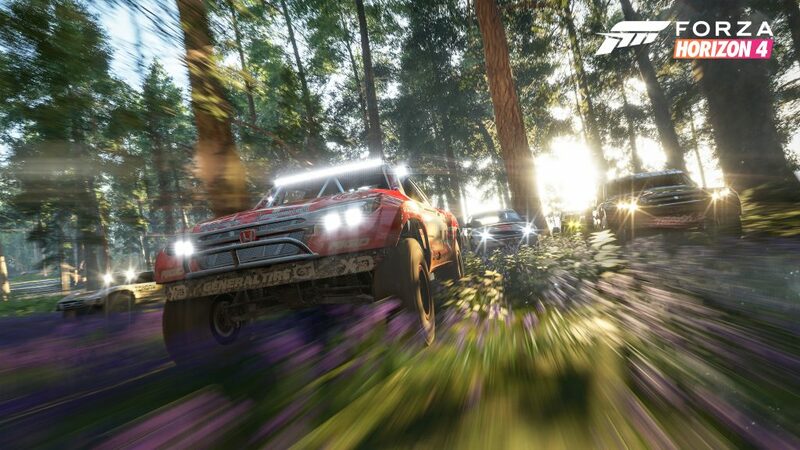 If you’re new to Forza Horizon, your aim is to explore a gorgeous open world to partake in multiple races and events ranging from dirt races to danger sign jumps and set piece filled races called Showcase events. 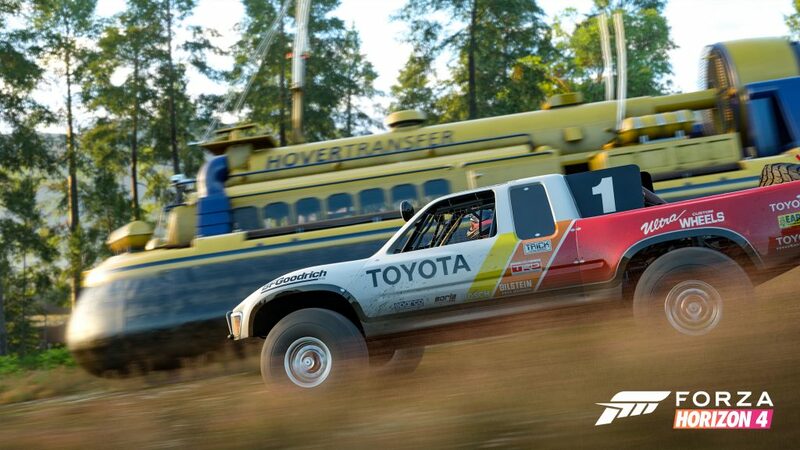 In addition to those, Horizon 4 has its own set of more story filled campaign that are basically like mini campaigns you play through at your own pace whenever you want to and these are spread across the map and have their own levelling system with rewards that complement the main levelling up system. 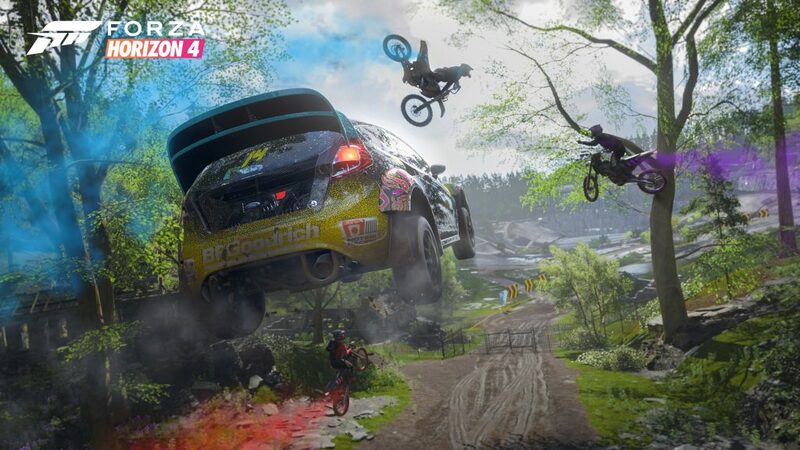 Forza Horizon 4 has a very interesting way of bringing the player into the “real game”. While the opening moments are always beyond epic, I’m a big fan of how things play out for the opening section here. Seasons are a big focus for Horizon 4 and the opening race segment lets you experience all four seasons in a single section. This follows up with you learning the ropes and experiencing more in depth weather and race conditions in each season as you try and unlock more events through earning influence. Influence is a big part of the experience here and you use it to progress things initially. Influence is earned through race completion, skills, Barn Finds, and more. One of the bigger additions is Houses. You can now buy houses across the map and each house includes various perks and rewards ranging from giving you a few wheelspins to one that unlocks free fast travel everywhere. The concept of houses in an open world game is great but the implementation could be better. You can’t fast travel for free to your home which makes buying most houses pretty pointless outside of the few rewards you get. One change that has been done well is the per car skill point system. You now earn skill points and have a specific skill tree for each car. This encourages you to shake things up and try out more cars rather than getting through as much as you can with a single car. You earn skill points pretty easily so this never felt remotely grindy. The Horizon games have always had excellent visuals across the board and while earlier games have resorted to expansions for extreme weather, seasons now offer that in the base game. Car models are superb and the skyboxes are as beautiful as ever. The recreation of Britain here is pretty great as well with everything looking good across all times of the day. On the Xbox One S, I ran into a few visual issues. Some situations have some really bad pop in more so than Forza Horizon 3. While the racing performance was consistent, the menus feel like they could be a bit more responsive. In fact a low end gaming laptop from a few years ago had the menus much more responsive than the Xbox One S.
Ever since Horizon 2, I’ve been discovering some great music through Horizon Pulse specifically and with both Forza Horizon 3 and 4, I didn’t really wait for the game before getting into the music through playlists on streaming services. Horizon Pulse is probably the best licensed music radio station in gaming ever and it is even better in Horizon 4 thanks to the host making a not so subtle Allo Allo reference while discussing an in game event. The rest of the audio is as good as it ever was with nice voice acting and great car audio. Outside of the visual issues, the only real problems Horizon 4 suffers from are from the showcase events being a bit weak or losing their wow factor a few games into the franchise and the poorly implemented houses mechanic. Everything else here is a step up from previous games but things are definitely starting to feel evolutionary rather than revolutionary. 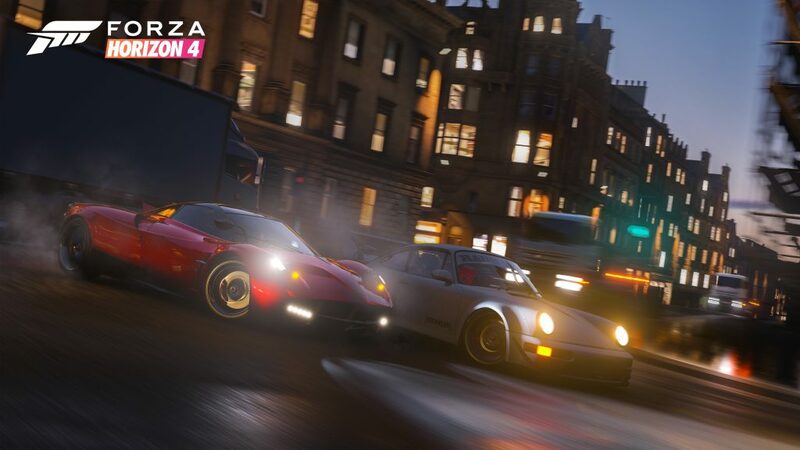 Forza Horizon 4 is an essential game for any racing game fans with its superlative production values, brilliant gameplay, great implementation of seasons, and how it manages to make things feel fresh dozens of hours in. While some aspects of it may seem a bit evolutionary, this is still an essential racing game and one you need to play if you have an Xbox One or Windows 10 PC.